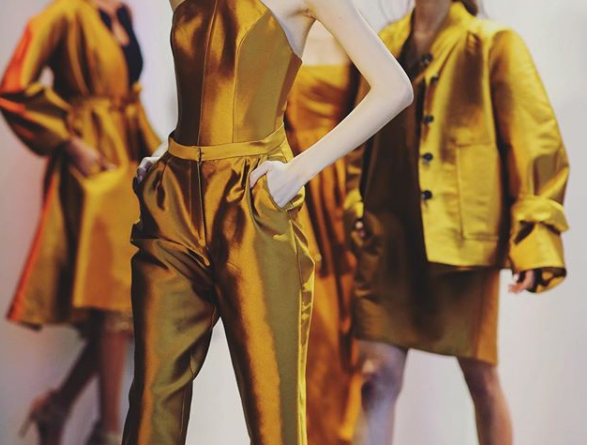 2018 is the year of color for luxury designers showcased at New York Fashion Week. The February NYFW shows focused on upscale and out-of-the-box apparel that make the eyes open wider with bright and light colors. Among designers who walked on the pastel side is Jeremy Scott. The designer used top models including Gigi Hadid to wear colorful wigs, pastels mixed with bright metals for a futuristic look. 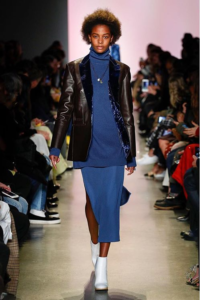 Designer Dion Lee used bold colors including red and white to showcase the Fall 18′ collection for the brand including shoes with high block heels. Tan and crimson were a part of the footwear collection colors for Dion Lee. Columbian-based designer Estaban Cortazar used bright red and a bold hue of cobalt blue as a part of his collections. Denim focused designer Alan King of AKINGSNY debuted its new denim collection with a special fashion week showing and popup shop. AKINGSNY features orange vegan fur, deep blue raw denim and more casual styles for its Fall 18′ collection. Michael Kors was among the larger fashion shows of the week with a large auditorium in New York City’s Lincoln Center, home of the New York City Ballet. Kors mixed statement making colors and animal prints on the runway. Lujin Zhang used pastel pink and bright white on the runway among its colorful collection. Handbags were walked on the runway with the festive ready-to-wear and evening apparel. Designers Leanne Marshall and Mac Duggal featured evening wear, gowns and bridal fit for black tie, prom and wedding season. The flowing gowns were a delight to see down the runway. See photos from the NYFW runway on our Instagram story!